Also called grey squirrel, it is a mammal arboreal rodents, common in North America. Usually gray, it can also have a brown coat, black or, more rarely, white or cinnamon. The grey squirrel is very abundant especially in the Montreal area while it is mostly brown, more or less dark in Toronto.To distinguish it from the red squirrel gray-brown or black coat, its coat is usually gray, with brown tones especially in the head and the tail, ventral parts remain white. Although, it frequents parks and gardens, the natural habitat of the gray squirrel is the forest, where it can always find enough undergrowth to hide at the sight of predators. 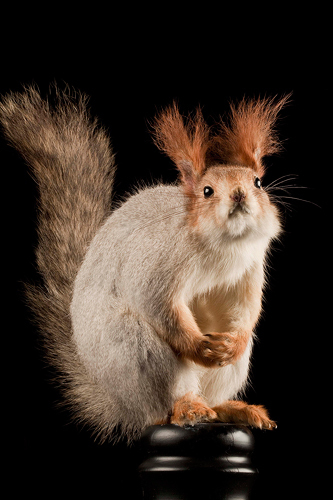 The squirrel builds its nest on a bare branch or in a hollow trunk. It often grabs a crow’s nest of twigs that covered roof to protect the interior. The nest is usually lined with foam, thistle down, dry grass and feathers. Grey squirrels can build several nests and use them in turn. Maternity nests are reserved for female and youngs, but the winter nests and visiting nests are often occupied by several animals who stand hot. Females can mate only twice a year, the males can mate all year round. The youngs are born in spring.Grey squirrels are omnivorous, feeding on acorns, chestnuts, hazelnuts, berries and other fruits, sap, bark, flowers and buds, eggs and nestlings insects. It accumulates reserves in the ground or other locations. It must eat every day, even in winter; it can identify its reserves in the snow. It does not hibernate and can not store enough energy to survive long without eating.